The world has been undergoing a rapid pace of globalization especially in the past few decades, but what will its next phase be like? How would globalization impact on talent flow, particularly on highly mobile, digital-savvy yet picky professionals with the world as their oyster? Well, 41 global thought leaders share their personal views on the next phase of globalization, the increasingly competitive talent wars and the rise of the new digital generation in a newly-launched series of video interviews at the No Fear community site. Some of the interviewees featured include Justin Fox of the Harvard Business Review, Bill Fischer of IMD Business School, Olli Rehn of the European Commission, Rovio‘s Peter Vesterbacka, and GE Capital’s Holger Laubenthal, amongst others. “It has been an honor to receive such valuable insight from top academic, business and political leaders, as well as the ‘Digital Cowboys’ themselves. My dream was to facilitate some new thinking and knowledge-sharing. Our whole economic system is currently living in the eye of a hurricane. Growth, modern leadership and regaining trust are the only way out,” says Pekka A. Viljakainen, facilitator of the No Fear project. 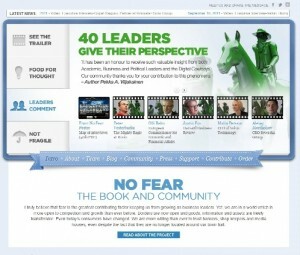 All the video interviews are freely available on YouTube and there is a free, global discussion forum for these topics at No Fear. Do also check out an interview I had earlier with Pekka A. Viljakainen about his project (Part I, Part II), as well as my review of his book “No Fear: Business Leadership for the Digital Age“.